The Gurgaon-based SaaS provider is helping companies move away from paper-based sign-in. Vaibhav Jain, Vice President, Product and Operations, is an IIT-Dhanbad alumnus and worked with Teramatrix as a professional responsible for IoT platform sales and product management. Anoop Poonia, an IIFT-Delhi graduate and Hero Group's former country manager in Sri Lanka, is now Vice President-Sales. Aastha Sharma, Vice President-Growth, is a graduate of Tata Institute of Social Sciences and worked as a marketer with The Body Shop and Avon. In their course of work, the trio had often witnessed how the logbook sign-in resulted in long waits, inaccurate records, security breaches and visitor data leaks. Even a fully automated system runs the risk of a security breach if it is not integrated with the company's security system or cannot use government databases for authentication. After some intense brainstorming, they set up Digicred Technologies and came out with Veris, a multiplatform, cloud-based visitor management system. The Veris kit contains a terminal (mostly iPads), a user app (both iOS and Android versions are available) and a dashboard. A visitor can either pre-register via the app or input details via an onsite iPad and get a unique QR code for quick access. Terminals across locations also work in sync to provide an overall view of visitor activity. Other security measures include time-bound invites, visitor arrival and overstay alerts, watch lists and emergency evacuation lists. Veris also integrates company-specific parameters with its core product. All visitor data is encrypted and securely stored in the cloud, and can only be accessed by authorised teams via live dashboards. The system can be internally used for conference room and event management, parking system integration and providing necessary access and digital IDs to field/outstation/temporary staff. 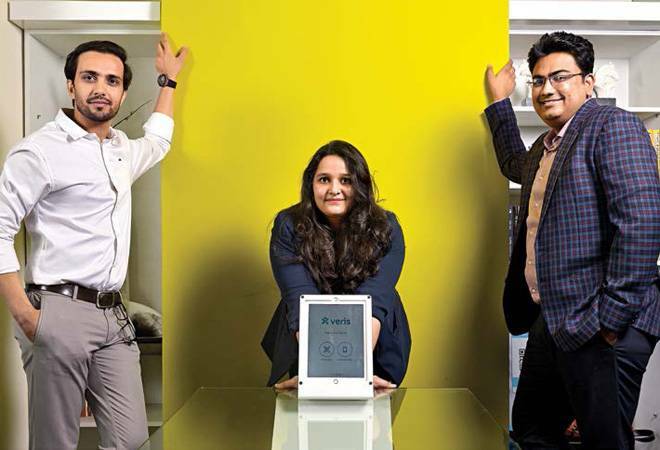 Veris has a subscription-based revenue model and currently caters to more than 20 large enterprises, including EY, Mercedes Benz, InterGlobe, Bharti Realty, DLF, British Council, Royal Bank of Scotland, Lava Mobile and Wonder Cement, among others. Additional revenue comes from hardware commissioning and product customisation. It is also planning to expand to South-east Asia and West Asian countries in 2018.